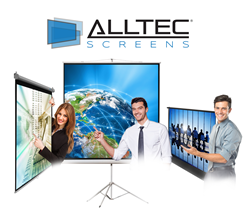 Alltec Screens, manufacturer of high quality projector screens for residential and commercial applications, with eight projector screen categories including electric, fixed frame, inflatable outdoor, manual, floor rising, folding frame, table-top and tripod projector screens launches a formal reseller program. Our lineup of screen offerings is robust and our products are available for immediate delivery. We’re excited to work with the best Independent Manufacturer Representatives. Alltec Screens, an innovative designer & manufacturer of high quality projection screens, today announced its formal reseller program for the residential and commercial markets. Alltec Screens has been providing electric, fixed frame, inflatable outdoor, manual, floor rising, folding frame, table-top and tripod projector screens for applications in the home, corporate, education, government and houses of worship environments since 2015. Alltec Screens offers more than 80 models of projector screens and accessories sold through commercial and residential technology integrators. Resources found on the http://www.AlltecScreens.com website include specifications for all models of Alltec Screens, an Alltec Projector Screen Buying Guide and a Viewing Distance Calculator. Alltec Screens was born from decades of experience in the world of Pro Audio/Visual technology & presentation equipment. Our screens are designed to ensure the best quality, durability and performance and we offer a wide variety of projection screen solutions for classrooms, offices, conference rooms, media rooms, outdoor venues, and for the ultimate home theater. Alltec Screens is a division of New Jersey based VCOM International Multimedia Corporation. For more information, please visit our website at http://www.AlltecScreens.com.